What is a camping cot and what is it used for? 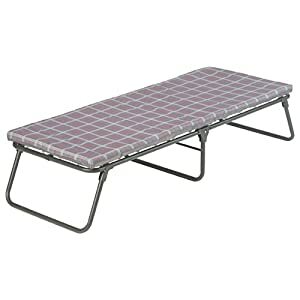 A camping cot is essentially a raised portable bed that is ideal for use when camping. However it can also be used as a temporary bed in your home, for example. when you have guests staying over. 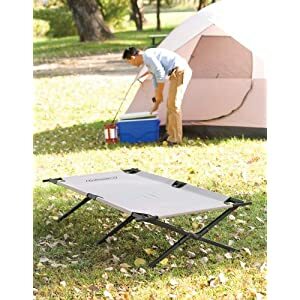 Due to the lightweight design of sleeping cots for camping, they are a better choice to take camping compared to a portable hammock stand set. They are also a little easier to set up and the difference in weight makes them more ideal to carry over long hikes. 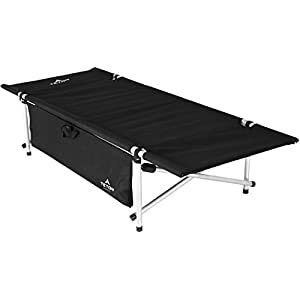 As with portable hammock stands, camping cots also come complete with handy carry bag which makes transportation, storage and carrying by hand an easier task. 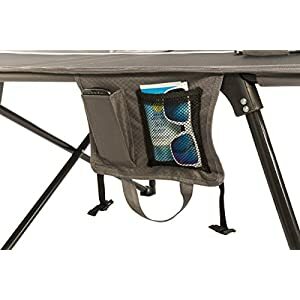 Another big reason that camp cots are a much better choice for camping compared to portable hammock stands, is that they sometimes feature storage pouches. On some models, the storage bag that the camp cot is transported in, can be attached to the side of the cot to double up as a handy storage pouch to keep accessories close at hand. 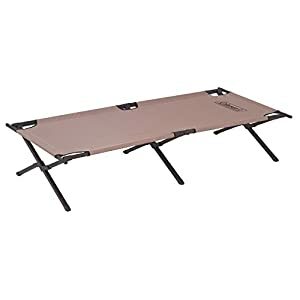 Generally speaking camping cots have lesser weight capacities than portable hammock stands do, however this is mainly due to the fact that they are designed for single person use. Whereas most portable hammocks with stands are designed to accommodate 2 people at a time. Further down the page we will take a look at more pros and cons of using a camping cot as well as compare specifications to conclude why a cot bed may be a better choice for camping over a hammock and stand set. The Coleman ComfortSmart Cot comes in a standard (grey) variation or the larger deluxe (black) model and there is not a great deal of difference in price between the two variations. However, when it comes to size and strength the deluxe model is by far the better choice overall. The standard model is suitable for users up to 5 ft 7″ so it is not especially useful for taller users, whereas the deluxe black cot can accommodate users up to 6 ft 6 inches. The deluxe camping cot can also hold a little more weight (300 lbs) when compared to the standard sized Coleman camp cot that can hold up to 275 lbs. Although it is true that there are better looking camping cots on the market, there is no denying the popularity that this Coleman camp cot receives. It has loads of buyer reviews left and a very high average rating, making it an outstanding choice overall. 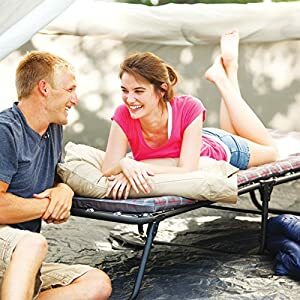 The Coleman Camping cot is great for comfort and features a covered foam mattress pad and a coil suspension system to make it feel more like a bed. With regards portability, the Coleman camp cot is fairly lightweight and folds in half for easy transportation. However, since it does not come with a carry case there are more convenient options to take camping that are available. Overall you simply have to read the buyer reviews to see how much these camping cots are loved by most who buy them. Many love how well made and comfortable this camping cot is, as well as how easy it is to transport. However, many find the standard model a bit on the small side so the deluxe cot is certainly recommended for adults. If you are looking for a camping cot for kids, the standard model should suit them perfectly (provided they are under 5 ft 7″). If you are in need of a very large, very popular and very well rated camping cot, then the Teton Sports XXL camp cot is an ideal choice for you! The large 600 lbs weight capacity makes this one of the most sturdy camping cots for heavy people currently on the market. In addition to this the spacious 85 x 40 inch bed makes this cot suitable for the majority of body sizes. The reinforced steel S-leg design makes this camping cot a very strong choice to use at home if you have guest staying or on the move. 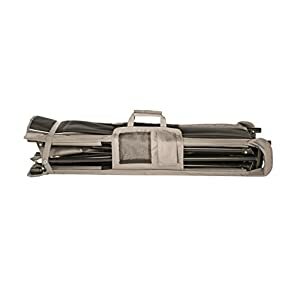 The total pack weight is 26 lbs making this a fairly portable option and it comes complete with a very handy carry bag. Anyone wishing to use this Teton Sports camping cot while in the great outdoors also has the option of adding storage compartments (sold separately) onto the cot so you can always have the essentials close at hand while you sleep or relax. From reading the many buyer reviews, you really get a great overview of just how good this cot is. Many mention how incredibly comfortable the cot is and how it has granted them with an amazing nights sleep wherever they use it. It is also often mentioned just how big and sturdy this camping cot is and what a high quality piece of camping kit it is. Overall this is a very affordable camping cot that is an ideal choice for the majority of users, no matter what their body size. The Teton Sports XXL camping cot is also backed by a limited lifetime warranty, as are all Teton Sports products, so you can buy with total peace of mind. One slight negative is that this camping cot is not the easiest to assemble and assembly may take a little getting used to and require a little effort. Over time however, most find that once they have assembled it a few times it becomes a little easier, quicker and less hassle. All in all this is a great camping cot for heavy people. There are two main reasons to choose this camping cot over others on the market and these are the price and the portability! This is one of the cheapest and the most lightweight camping cots available, making it ideal if you want to use it while camping. The cot can be assembled and taken apart fairly quickly (after some getting used to) and it comes complete with a handy carry bag for further convenience. Due to the low priced and lightweight design of this camping cot there are areas where it could perhaps be improved. For example the weight capacity is a little lower than most other cots at 225 lbs, however it is still a good fit for many. Many compliment this camping cot on how comfortable it is and how compact it is also. 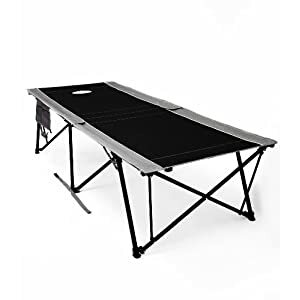 Some do state that this is a bit heavy for camping gear, however for the price, the 10 lbs weight should be fairly manageable for most and when compared to other camping cots on the market is it fairly lightweight. Overall, opinions are a little mixed. Some consider this Mountain Trails cot to be very easy to assemble while others feel it is a real chore. Others find in incredibly lightweight and find it no effort to carry whereas as some find it rather heavy. It is always hard to please everyone, however many agree that for the price this is a very good camp cot that can be easily transported and stored. 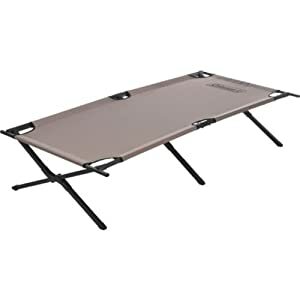 When it comes to price and strength, the Coleman Trailhead military style camping cot is a clear favorite. Many also consider the Mountain Trails camping cot (featured above) an equally good low price option, however in our opinion the Coleman Trailhead 2 is a slightly better choice due to the higher weight capacity and more robust design. The Trailhead II however, is not quite as portable and weighs around double the weight of the Mountain Trails cot. The size of the Coleman Trailhead is pretty good overall and it is suitable for users up to around the 6 ft 2 mark. It also has a fairly wide sleeping area that measures approximately 30″. Overall opinions are a little mixed when it comes to the buyer reviews and not everyone is convinced by the quality of this cot. Some also have a little trouble when piecing together the last part of the cot during assembly, stating you need a bit of strength to do so. 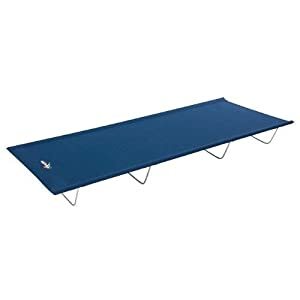 However, on the contrary, there are many who rate the quality of this camping cot very highly and consider it to be a very comfortable, low priced option. Ultimately the main reason for opting for this particular camping cot is clearly the price. 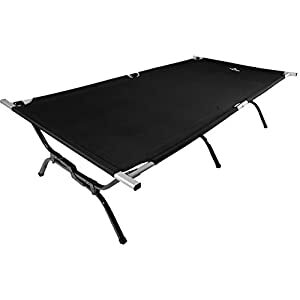 It is one of the cheapest camping cots currently available and considering the low price some should maybe give it a little leeway in the quality department. As has previously been stated though, many have no problem with the quality or the price, you should however read the reviews before committing to a purchase. The Kamp-Rite oversized camping cot is a great choice for a wide range of users and ticks all the right boxes. It has a large bed area which measures 7 ft in length (84″) making it an ideal choice for taller users, in addition to this the wide 33 inch bed area provides a good amount of space. The 350 lbs weight capacity is also a great reason to opt for this sturdy camping cot. If however, you feel you need more space and strength the Teton Sports XXL further up the page is a larger and stronger camp cot to opt for! Overall as you would expect from a camping cot that is considered a good all rounder, everything about this camping cot is above average. Both the size of the cot and the comfort it provides are great and the camping cot is considered very easy to set up and disassemble by the vast majority of buyers. 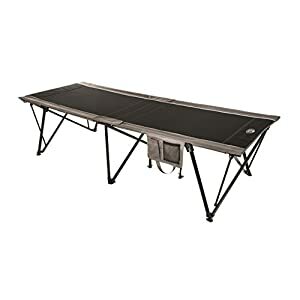 Also the 350 lbs weight capacity makes this a very good choice when compared to other camp cots in a similar price range. Many buyers love using this oversize camping cot as a spare temporary bed and while camping and most are very impressed by what a great nights sleep it can offer. The carry bag is a nice addition with this camping cot, however some state that the quality of the bag could be improved, mainly the zip which appears a little cheaply made. As is often expected with all products there are also a minority that have issue with the cot itself in terms of quality, but they do seem fairly outnumbered. In summary, if you are looking for a well priced camping cot that is suitable for a wide range of body sizes this is an ideal choice. It is easy to set up and provides excellent comfort whether you are indoors or camping. As with all furniture style items there are a number of things you should take into consideration when looking for the ideal cot for you. Below are some of the main things to consider and you should always find out as much as you can about each of them, when looking for the best camping cot for your needs. If you have any trouble finding this information in the manufacturers product descriptions also take a look at the buyer reviews and FAQ’s as there is alwasy a lot of additional product information to be found. Before considering anything else you need to ensure the camp cot you are looking at is large enough for you comfortably rest upon and strong enough to take your weight. There are a wide range of camping cots available and they all differ a fair deal in size and strength. Lets start by comparing the bed sizes, overall dimensions and weight capacities of 5 random camping cots to see the differences. As you can see the top camping cot in the list is the best choice for heavier and larger users (This is the Teton XXL camping cot featured further up the page) whereas the other cots in the table are fairly well sized for average sized users. When searching for a camping cot you should be able to find this information very quickly as most manufacturers will list it very clearly. If you are unable to see the size of the bed area listed, you can generally use the overall width and length dimensions as a fairly accurate measurement of bed size. As is often recommended it is always worth reading buyer reviews to see how others found the size and strength. You will often find users stating their own height and weight and commenting on how much, or how little space they have when laying on the camp cot. 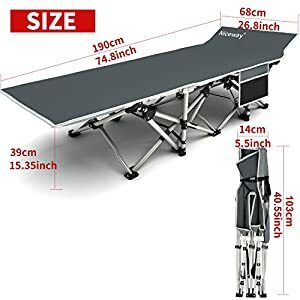 You will also quickly see if anyone had a bad experience with regards weight capacity as bad reviews will often highlight if the camping cot broke under a certain amount of weight. Comfort is obviously a very important aspect and one that goes hand in hand with the size of the camping cot, after all a camping cot that is too small isn’t going to be a very good choice for optimal sleep. Unlike other features such as the size, comfort cannot be easily measured and therefore to find out how comfortable a particular camping cot is you will likely have to search in the buyer reviews, unless you have actually tested the camping cot previously. 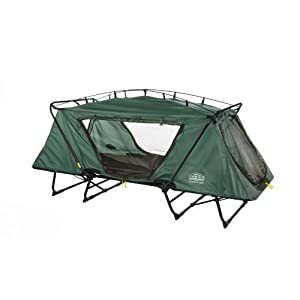 Luckily buyer reviews are a great way to gain this sort of information and most reviewers often mention how good the camping cot is for camping and for sleeping on. You will generally find that most camping cots use either a spring system or stretched fabric across the frame for support while sleeping. While most camping cots are not going to provide you with exceptional comfort, you will probably be surprised at how effective, comfortable and supportive many find the majority of camp cot beds to be. 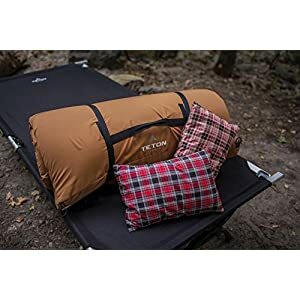 You may also wish to use a padded foam camping pad like this one from Teton (Pictured) that can be placed upon the camping cot for further comfort. However, if you are planning on camping with the cot, bear in mind that this will add to the overall weight of your load. Also camping pads are an additional cost and are rarely included in a camping cot package. 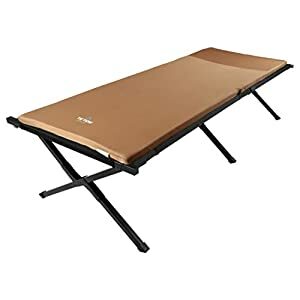 This is obviously important if you plan to take your camping cot camping or hiking, but can probably be overlooked if you are simply looking for a temporary bed for guests to use when they visit. Although if you are in need of a temporary bed for when guests stay the storage dimensions are something you should seek out, as some camping cots are more space effective when folded or disassembled than others. When it comes to portability there are some camping cots that are easier to carry, lighter to carry and easier to set up than others and all of these are important aspects to consider. Lets use the 5 previous examples to see their average weights, we will also mention if the camping cot listed comes complete with a carry bad for easier transportation. As you can see, the weight of a camping cot can vary a great deal and therefore if you are going hiking some of the heavier cots may be a bad choice. Ultimately you need to “weigh up all of the options”… Taking into consideration that the lightest camping cots for hiking are probably not going to be the largest or most robust choices. They are however, going to be much easier to carry, take up less space and be quicker to set up and take down. On the other hand more robust, larger camping cots are likely to be a little more comfortable and stable, but they will also likely be a little more effort to assemble when in the outdoors and heavier to carry by hand! Once again, be sure to read the buyer reviews for any camping cot that catches your eye, as you will soon find many buyers will have noted how easy that particular camping cot is to transport, store and carry. Or how un-portable that particular cot may be. Generally speaking most camping cots can be purchased for under $100, however there are exceptions to this that can cost a bit more. 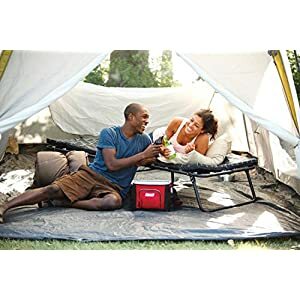 The more expensive camping cots are often the XL and XXL variations, although you will often find these fall into the under $100 bracket also. If we take the average cost of the 5 random camping cots we have been using in previous examples it averages at around $73.80. 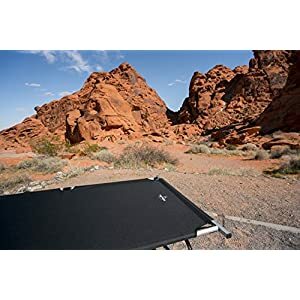 You will often find that the cheapest camping cots retail at about $40 and these are usually the most portable hiking options that are set very low to the ground. A good example of this type of camp cot is the Mountain Trails camping cot, featured early on the page. Most of the camping cots that have a strong steel framework tend to retail at around $50 – $100. 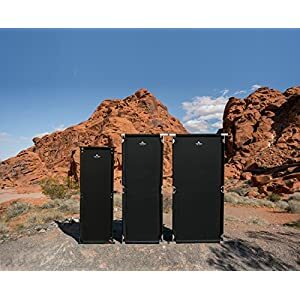 You will also find there are some camping cots that feature a tent built into them, we will look more into these later, but they generally cost in excess of $150 and are the most expensive options. You will find that the majority of well rated camping cots are made from fairly high quality materials, so this is probably one of the lesser features you need to concern yourself with. The majority of cots will feature a steel frame that is powder coated to add a layer of protection against wear and rust. You will also find some of the more lightweight camping cots feature Aluminium frames to make them more portable. Generally the fabric on most camping cot beds will be 600 D (denier) Polyester fabric, a fabric that is both strong and durable, it is also considered by many to be very comfortable and supportive. You may also find some camping cots with 1200 denier Polyester beds and other cots with lower denier values such as 420 D. The higher the denier the stronger the fabric is. Some camping cots will come complete with extras such as a storage pouch included. You can see above that the Kwik cot from Kamp-Rite has a small storage pouch attached that hangs from the side. These are very useful to keep accessories close at hand and provide a neat and tidy area to keep small objects close by, so they don’t get lost while camping. On some models of camping cot you can also buy organisation pouches separately. 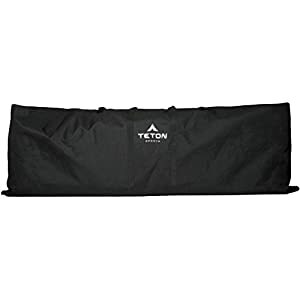 The Teton Sports brand have a number of storage organizers that can be attached to a camping cot including large and wide pouches that hang down from the side of the cot and under cot storage holders that can be suspended under the cot bed. On the Teton camp cot (pictured) you can see that the included carry bag actually doubles as a storage pouch. Storage organizer pouches can be clipped or tied easily to the frame of the camping cot and are a great addition to add a bit of order while you are in the outdoors. If you felt like having a waterproof cover for your camping cot, you can even find camping cots that have a tent inbuilt into them, such as this Tent Cot from Kamp-Rite (pictured) and you can even get camping tent cots that are big enough for the whole family. Camping tent cots are very easy to set up and some can be erected in seconds providing a quick all in one solution to sleeping in the outdoors. You can even get some tent cots that weigh around the same as standard camping cots making them a fairly portable solution that can be easily transported. Tent cots are generally more expensive that regular cots and are roughly around double the price for a single person cot. For a family sized tent cot you will usually expect to pay in excess of $300. Do I need to assemble the camping cot? This question is dependent on what camping cot you choose. Some such as the Niceway camping cot (pictured) simply fold out and can be folded back in without any real effort. Others however, do require a little assembly and some are easier than others to set up. When deciding on a camping cot you can check if the manufacturer has a video on the product page and watch it to see how straightforward the assembly actually looks. You can also read the buyer reviews and buyer faq’s as these will always have plenty of assembly information about the particular camping cot and often state how quickly and easily most found the assembly process. Do you feel the bars across your back while laying on a camping cot? No. The way camping cots are designed ensures that there are no bars running horizontally across the bed area to interfere with your comfort. What is the maximum weight capacity of this camping cot? This information should be very easy to find and if it is not clearly listed then you should probably consider another camping cot. 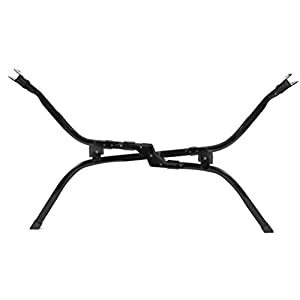 The weight capacity should be one of the very first things listed by the manufacturer and if it is hard to find this information, it could be considered a little untrustworthy from the manufacturer. You are however, very unlikely to find a camping cot where the weight capacity isn’t clearly stated. It is therefore, a little bizarre that this question pops up so frequently. 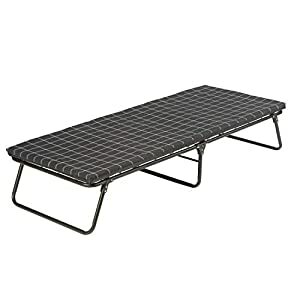 Should I use an air mattress / pad with this camping cot? You will often find that most people consider camping cots to be comfortable enough as they are. 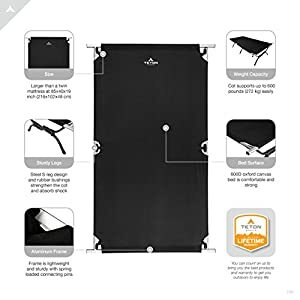 However, if you are a light sleeper or often have problems when sleeping on unfamiliar surfaces, you can always look to invest in a camping pad for use with the cot. There are a number of camping pads to choose from so you should easily find something suitable for you to make your cot more comfortable. How much does a camping cot weigh? As with the weight capacity this varies from cot to cot and the manufacturer should clearly state this information. If however, you are having trouble finding the portable weight of a certain camping cot it is worth looking in the buyer faq’s and perhaps the buyer reviews as you will probably find this information there.